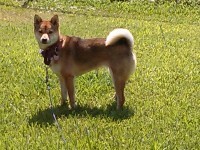 We adopted Suzuki (Zuki for short) on August 5, 2011, from Young-Williams Animal Center in Knoxville, TN. She somehow, miraculously, fit in perfectly with Snickers and Secret and became our "perfect third." Zuki needed more than a fence to keep her safe at home, but a stake and tie out wouldn’t have provided enough space for her to run around. My father came up with the idea for this long cable run which solved the problem. Here are the instructions (with photos) for how we built it. 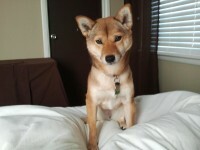 Happy (belated) Gotcha Day Zuki-San! 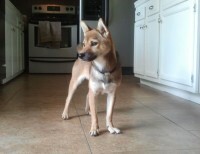 August 5, 2011, we drove all the way to Knoxville, TN, and back to bring this little Shiba girl home.